The value of pipe #398 is n/a points. 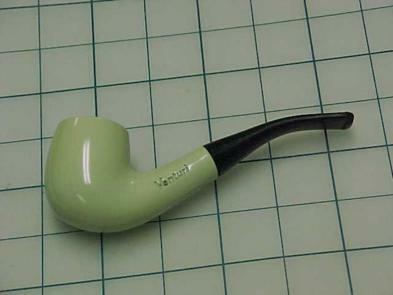 Teresa Buky offered this pipe on eBay. The bidding was not too intense, probably because White Venturis are fairly common. However, I thought from her photograph that it might be a grey pipe - an altogether new color for a Venturi - and so I entered a bid at the opening price. I was sorry to learn that it was a greyer shade than most Venturi pipes, but not sufficiently so to be called a new color so I will offer it on the Pipes for Sale page. Didn't take long for Al Eckhoff to take a shine to it, so it has found a good home.